Unfortunately in recent times people have suffered from debt problems and the anxiety that this creates can be huge. Selling your home or other property can be one solution though this can usually take months to complete, its not usually a quick solution. 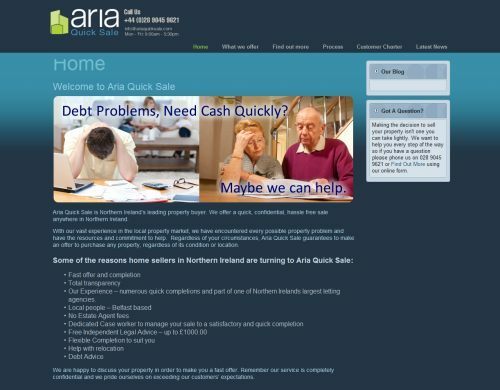 Aria Quick Sale offer help and release from debt problems quickly and easily by offering to buy Northern Ireland property quickly, confidentially and with no hassle. Regardless of your circumstances, Aria Quick Sale guarantees to make an offer to purchase any property, regardless of its condition or location.